Given the conditions under which Broken Age was developed, it makes sense that playing through the game in its entirety never once comes across as something that was meant to be episodic. There is little in terms of new characters to meet or places to visit in the game’s second act, but it keeps Broken Age from feeling fractured at any point, even at Act I’s remarkable ending. While the instant Act I concludes was one of 2014’s most memorable moments, part of what made it so incredible was the knowledge that it was a cliffhanger, and you weren’t sure when you’d see it resolved. Thankfully, immediately jumping into Broken Age’s second act does little to diminish the impact of the final moments of the first; but even so, the second half of Double Fine’s return to point-and-click adventures never lives up to the moment right before the screen faded to black over a year ago. Broken Age stars two seemingly unrelated protagonists: Vella, a young woman being prepped as a sacrifice for a monster called Mog Chothra in order to save the citizens of her hometown, and Shay, a boy who has spent his entire life on a spaceship under the protection of an AI who is insistent he refer to it as his mother. These two are worlds apart, but Vella and Shay are both still subjected to unfortunate fates forced upon them by people who insist that their honorable sacrifice and mundane life, respectively, are for the greater good, and their questioning of those claims is often met with accusations of cultural disrespect and ungratefulness. 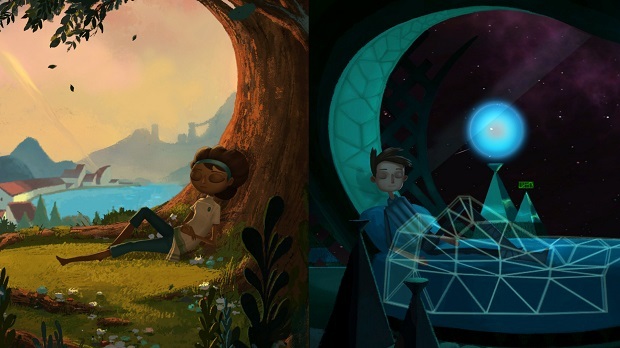 Even when Broken Age is portraying two very different characters in two very different situations, the underlying theme of questioning or succumbing to tradition runs through the game’s veins, as Shay and Vella’s attempts to take control of their own fate aren’t the only stories of self-discovery and longing for purpose to be found within the game’s world. While it’s often hidden within Double Fine’s clever and laugh-out-loud humorous writing, profound moments of questioning one’s reason for existence are found throughout both sides of the story. It’s this poignancy that makes Broken Age’s attempts to explain the reasoning for its contrasting worlds all the more disappointing as Act II progresses, as the game’s big picture isn’t nearly as enthralling as the themes that shape it. This means that much of Broken Age’s story’s originally intriguing elements and characters fade into the background as white noise in favor of the more personal moments as the game goes on. Throughout Broken Age, players can switch back and forth between Shay and Vella at any time, each with their own inventory and problems to solve. As Act I is carrying on a façade that these two worlds aren’t connected, the first half of Broken Age keeps puzzle solving more simple and manageable. The puzzles do fall into questionable adventure game logic pitfalls, but the longer players are in Broken Age’s world, the easier it becomes to find solutions with even the most absurd of item combinations. However, this more reasonable challenge is not maintained in Broken Age’s second act. Act II drops the illusion that Shay and Vella aren’t connected, story threads that were supposedly isolated from one another become direct parallels, and players have to use the knowledge of both characters to solve puzzles. Unfortunately, Broken Age stumbles in its attempts to utilize a potentially interesting mechanic due to its inability to telegraph these kinds of solutions to the player. Broken Age’s second half has a marked issue with clarity, with some problems seeming to have arbitrary answers, and others being too obscure for anyone other than the most meticulous of players to be able to solve. The idea that both Shay and Vella could potentially have to work together to complete tasks could have flipped Broken Age on its head, but instead it just becomes a tool for frustration that can often undo hours of satisfying problem solving that took place before. Broken Age is not for the impatient, and is best suited for those eager to have to think outside the box. There are a lot of more enjoyable puzzles to complete, but that joy and accomplishment that you feel from completing them is often diminished by those deprived of logic. When I played Act I of Broken Age last year, I laughed, cried, and was left slack-jawed as the credits started rolling. The addition of Act II carries with it much of the same humor and moving character moments, but fails to tell players that the entirety of the game has changed, or give a really engrossing justification for how it all comes together. When Broken Age is at its best, it’s incredible. When Broken Age is at its worst, it’s insufferable. What it all culminates to is something that is merely good. Shay and Vella’s story is one that is worth experiencing, even if the story that surrounds its more personal moments is never as interesting as the revelation that it exists. Despite long stretches of anger-inducing logic in Act II, Broken Age as a whole is a poignant and clever adventure game that is worth playing through, even if it never lives up to the promise of its midpoint.